Thank you for buying this St. Martin's Press ebook. To receive special offers, bonus content, and info on new releases and other great reads, sign up for our newsletters. In vain you will look for the fences of barbed wire. with these thorns, refusing to be stone. First and foremost, thanks go to the families on Assael Street. This story is theirs, and the book would have been impossible without their willingness to share their captivating tales. Nawal and Zakaria Bazlamit, along with the entire Bazlamit family, always welcomed me into their homes over many years. Hijazi and Abdullah Bazlamit were particularly generous with their time. Rachel Machsomi and her many adult children, especially Rivka, were just as gracious when I came to visit them in Ma'ale Adumim. David, Alisa and Avital Maeir-Epstein repeatedly opened their doors to talk about their lives and were always willing to answer the smallest of questions. Khaled, Rita, Jamal, Amjad and Wafa Rishek were especially thoughtful hosts. Malka Joudan and her grown kids, Itzik, Maya, and Yaacov; Shimshon Jacoby; Rafi Goeli; Maha Salhab and her parents, Moussa and Khulood; Ziad and Randa Yaghmour all took time out of their busy lives to sit and talk. Elon and Linda Bezalely, Sara Arnold, the Gazawi family, the Mujaheds and Brent all helped make this story possible. I am grateful for the help of many people from Abu Tor, especially Hedva Harekhavi, Judith and Jeffrey Green, Saliba Sarsar, Sarah Sallon, Ricki Rosen and Jordan Herzberg. This book wouldn't have been possible without three particular friends who helped as translators and served as important sounding boards: Nuha Musleh, Orly Halpern and Cliff Churgin. Nuha, a Palestinian journalist, well known as a whirlwind who always juggles work, family and friends with grace, has an unparalleled empathy that opened every door we knocked on, year after year. Orly, a veteran Israeli-American reporter in Jerusalem, carved out time in her crazily busy days to provide advice, translation and perspective. And Cliff, an Israeli-American colleague I worked with for years, tracked down vital information and always saw the same thing I saw on Assael Street: a unique Jerusalem tale. Here at home, I owe immense thanks to my family for offering constant support and encouragement. Most importantly, I am grateful for the unconditional love of my wife, Seema, whose compassion and beauty make me always thankful to be her partner. From the UN archives in New York to Assael Street in Jerusalem, Seema helped shape this story from start to finish. This book is infused with her insights, which helped me see the story from a different perspective. Thanks to my mother, Barbara Vincent, for raising a son who I hope reflects her values and intellectual curiosity. My older brother, Kent Grayson, sparked my imagination as a kid and has always been one of my biggest champions. Thanks to Kent and my sister-in-law, Leslie, for being inspirations for me and for raising two independent daughters, Eliza and Helena. To Susan and Roy Henshaw, thanks for showing us all courage, faith and resilience. I am thankful to my father, Gerald Nissenbaum, and his wife, Madeline Celletti-Nissenbaum, for the boundless love, guidance and support that they offered over the years. And to my younger siblings Ben, Nick and Marleah for their help answering esoteric late-night questions or providing their artistic perspectives on this book. I am grateful to be part of the Jilani family, which embodies the best qualities of our faith: compassion, humility and kindness. I am particularly thankful to Afshan and Airaj, my mother- and father-in-law, for raising their fearless daughters and for being role models for Seema and me by creating rewarding, enriching and adventurous lives for themselves. Thanks to my sisters-in-law, Saira and Sana, and my brothers-in-law, Junaid and Mosaddiq, for their suggestions and jokes that kept me laughing along the way. To my niece Zaynab and my nephews, Zayd and Yusef: Thanks for reminding us all that life doesn't have to be so serious all the time! And a special thanks to Mohammad Shafiuddin, whose intellectual fire at age 92 is something to behold, and to his 81-year-old wife, Munir, who embodies humble generosityâwith a sharp wit. for taking on a last-minute research mission; Arlene Balkansky at the Library of Congress; Judith Feierstein, for her candor; and Adam Brill, Yossi Katz and the Jewish National Fund for helping dig up insightful details about the 1957 fight over their tree-planting project. and my editors, Bob Ourlian and Jerry Seib, who gave me the time and space to write this book. Thanks to Katherine Kiviat for her photos of Assael. Thanks to Busboys and Poets, the 14th Street DC cafÃ© inspired by Langston Hughes, where I spent countless hours writing. And I couldn't be more appreciative of my agent, Robert Guinsler, who believed in this story enough to make sure that it found a good home at St. Martin's Press, where Laura Apperson guided the book through the process and Karen Wolny took it under her wing. Above all, this is a story. It is set on one 300-yard, dead-end street in one little city. The people who live there always asked me: Why are you writing about this street? Nothing happens here. There's nothing special about this place. nothing special about this street. The people here go to work. They have big holiday parties that last long into the night. There are birthdays and funerals. They get angry about little things that sometimes blow up into big ones. They sing. They pray. They laugh. Occasionally, a punch or two is thrown. On the other hand, there is no other street in the world like this one. If there is going to be any common ground, this street is where it may one day be found. Literally. The border of future states is being defined, every day, on this street. Every inch here does matter. It matters whether a Jewish family lives on one side or the other. Buying or selling a home on this tranquil, cobblestone cul-de-sac is a risky political act that could reshape the future borders of Israel and Palestine. The narrow width of the road could one day determine whether you carry an Israeli passport or a Palestinian one. This street has been home to priests and prostitutes, poets and spies. It has been the stage for an improbable flirtation between an Israeli girl and a Palestinian boy living on opposite sides of the barbed wire along the front lines. It has even been the scene of an unsolved murder. This is a true Jerusalem story, one filled with love, war, exodus, deception and betrayal. On this street, nothing is too small to fight about. A deteriorating outhouse on this hillside once sparked a UN investigation. So did a homemade tin manhole cover. And a rooftop pigeon coop. There have been rock-throwing street brawls over parking spots and bloody clashes over missing holiday lights. Guns have been pulled. Men have been hauled off to jail. The stone and concrete walls outside people's homes carry an ever-changing series of spray-painted Arabic prayers, political slogans and veiled threats. Some of the doorways have small, tubular Jewish mezuzahs attached to them to keep a biblical commandment to honor G-d. Other gates feature spray-painted images of the Ka'aba, the widely recognized towering black cube at the center of Islam in Mecca, where Muslims believe the Prophet Abraham and his son Ishmael laid the foundation for their religion. Black-masked Israeli police in full riot gear have broken through Abu Tor bedroom windows to arrest Palestinians accused of one crime or another. Palestinian blue-jeaned teens with layers of checkered kaffiyehs covering their faces have hurled stones through bedroom windows and Molotov cocktails onto tiled roofs. Palestinian families have raised mourning tents for young men brought down by Israeli bullets. It doesn't take much to see where the lines are drawn on Assael Street. Everyone knows where they stand. Some people who live on this serene cul-de-sac think there is no hope, that Jews and Muslims will never really be able to live, side by side, in peace. Others believe realigning spiritual energyâand a little yogaâcould produce miracles for Jerusalem. Before this street ever had a name, it was just a small shepherd's path carved into the side of a Jerusalem valley said to contain the Gateway to Hell. When warring generals sat down in 1948 to split Jerusalem, their hand-drawn lines curved along this hillside. Israel took control of the top, said to be the Hill of Evil Counsel, the biblical site where Jerusalem's Jewish high priests plotted with Judas to bring down Jesus Christ. Jordan took the part that ran down through Hinnom Valley, the accursed Valley of Slaughter, the biblical scene of ritualistic child sacrifices and other unspeakable crimes. It was a cursed gash in the earth where well-worn horse trails ran past a mysterious cliffside tomb shaped like an ancient Egyptian pharaoh's hat. On the other side, in Jordanian hands, stood the part of Jerusalem that mattered most: the Old City. In both languages it meant the same thing: the Forbidden Area. Jerusalemites sometimes called it “Barbed Wire Alley.” Whatever name they used, they all saw it the same way: It was a dangerous No Man's Land that separated enemy nations. For more than 15 years, poor Jewish immigrants from the Middle East and North Africa lived on this border, across the barbed wire from poor Palestinian families. The two sides got to know each other from afar. The occasional waves of hello grew into people quietly tossing food and gifts over the border fence. Kids traded cigarettes thrown over the barbed wire for the dads on the other side to try. One boy lobbed a cheap ring that the girls on the other side thought might be cast with a secret love spell. Mothers tossed warm pita bread for a pregnant neighbor on the other side. One long-robed grandfather handed fresh-picked poppies over the fence to the younger woman who'd been secretly watching him from above. All the while, Israeli and Jordanian soldiers looked on from their border posts, keeping an eye out for any suspicious activity. Anything could be reason for concern. Even a bouquet of flowers. When the barbed wire came down in 1967, after Israel pushed Jordan out of Jerusalem during the Six-Day War, neighbors that once had to worry about being thrown in jail for talking to each other suddenly became friends. Muslim families brought lavish trays of food to Jewish families at the end of Passover. Mothers would gather in each other's kitchens to cook and knit while they taught each other Arabic and Hebrew. The kids, Jewish and Muslim, played together as well: The older kids shot pool in a tiny club down the hillside while the younger ones played soccer in the field at the top. After the fence was pulled aside, Barbed Wire Alley got a new Israeli name: Assael. Literally: Made by God. “This is where God connected Jerusalem,” said Moussa Salhab, a grizzled, chain-smoking Palestinian father whose family home in this No Man's Land was used by Jordanian border guards until 1967. It seemed as if it really was possible to bridge seemingly unbridgeable divides. The differences seemed negligible. They were neighbors. They became friends. Some got along better than others. It didn't take long for their lives to diverge. As it became clear that their fortunes were heading in different directions, the physical and psychological barriers started going back up. Gates were barricaded. The walls grew taller, and doors were sealed shut. Neighbors who once considered each other family stopped talking. The friendly waves became increasingly rare. People installed security cameras to keep watch on who was doing what on the street. Onetime friends quietly called Israeli police to report their neighbors for one problem or another. Some people started stringing barbed wire across the tops of their walls to keep others out. Sometimes it seemed like the only thing connecting the two sides of the street was a small beam of invisible, New Age healing energy. Redrawing Middle East nations is not a theoretical question to the families on Assael Street. If some people have their way, this old dividing line could become the new one separating Israel and Palestine. A few centimeters on a map matter to the people here whose entire lives have been shaped by poorly defined lines. Creating borders on a map is hard. Doing it on the ground, on this street, is even harder. The closer you get to the line, the more blurred it seems to get. But if Israel is ever going to live next to Palestine, the lines have to be drawn somewhere. And that could be here, down the center of Assael Street. This is a story about how people see themselves, how they want to be seen, and how they are seen by others. Unsurprisingly, the stories don't always line up. People remember things the way they want to. People forget things. Memories fade. We fill empty spaces with details that make stories a little more interesting. And the stories change a little bit each time they are told. In some cases, there are ways to figure the truth of a story by checking out newspaper articles, UN reports and other shreds of information that have survived the years. In others, all that's left of moments in time are people's imperfect memories. People remember the same thing differently, especially the neighborhood feuds. Families have secrets they prefer to keep private. Like all of us, they have stories they'd rather not have told. Some stories have been repeated so many times that they have become family legends. There are the ones they like to tell about themselves and the ones other people like to tell about them. In many ways, the stories people tell here are more important than what actually happened. The tales are passed, imperfectly, from one generation to the next. People define their lives by the memories they choose to remember and the ones they decide to forget. This is not the whole story of Assael Street. This is not the definitive story of Assael Street. This book barely scratches the surface of the lives of a few families on one narrow road. There is no shortage of tales to be told about the people living along this 300-yard dividing line. These are just a few. There is no escaping a suspicion of bias when writing about Jerusalem. “Do you think that people will assume biases because of your name?” one friend asked me. Judaism meant little more than going to my paternal grandmother's place to eat horseradish at Passover and haul in some comic-book money at Hanukah. Christianity meant going to my maternal grandmother's place for Christmas to fill up on her warm Spritz sugar cookies and search for hard-boiled, pastel-colored Easter eggs one Sunday morning each spring. While living in Afghanistan in 2010, I met an enchanting Pakistani-Texan doctor who was volunteering at a Kabul hospital. I soon embraced Islam in Indonesia and eventually married that doctorâthe love of my life. I've offered silent prayers in front of the Western Wall, at the Church of the Holy Sepulcher and in al Aqsa mosque. I am also a vegetarian; one who wears leather boots. I like to think that I am able to set aside my imperfect vegetarian beliefs when I write about nonvegetarians. I hope I am able to set aside my preconceptions in telling this story and that people will be forgiving of inherent biases that may seep into the tale. I hope readers won't get tripped up if a person is described in one place being Arab and in another as being Palestinian. I hope people won't dwell on whether a particular piece of land should be characterized as “occupied” or “disputed.” Though the little things are the ones that matter on Assael Street, this story is about much more than the details. This book doesn't provide a political road map with new ideas on how to solve what seems like an unsolvable problem. It's a snapshot of a small street that was, is, and may always be the front line for one of the world's most intractable conflicts. To me, Assael isn't just any street. For many years, it was the one right outside my living room window. Like a lot of Western journalists at the timeâfrom the start of 2006 to the end of 2009âI lived in Jerusalem's Abu Tor neighborhood. Choosing a home in Jerusalem is about more than finding a place with lots of light that's close to a market. Where you live is often seen as an unspoken declaration about your political leanings. For many Americans, living in West Jerusalem is the default, and any decision to live somewhere else might very well be seen as a slight against Israel. To Israelis, Westerners living in East Jerusalem are likely to be viewed warily because of their presumed pro-Palestinian leanings. Westerners living in Ramallah, in the West Bank, are likely to be branded anti-Israel. To Palestinians, any Westerner who chooses to live in an Israeli settlement is presumed to be unsympathetic to their dreams. 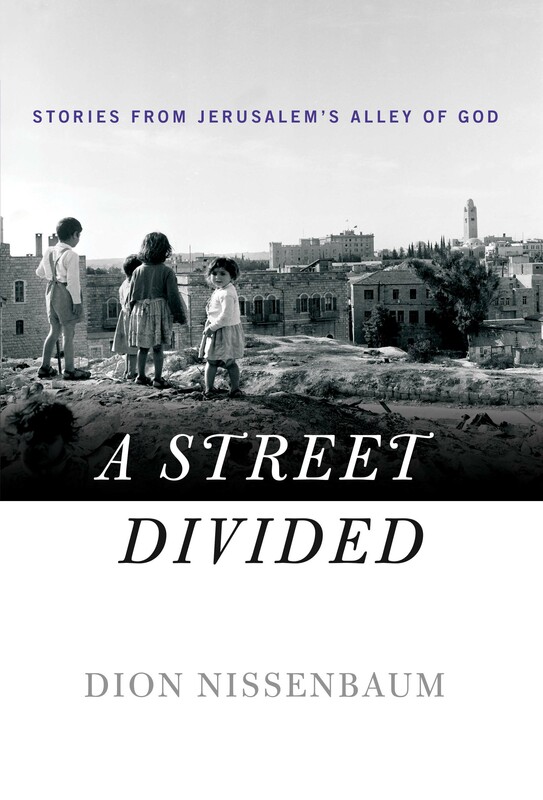 Living in Abu Tor, living on the old dividing line, was often meant to signal a willingness to treat both sides fairly, to look at the situation from both perspectives. Politically, culturally, psychologically, this is the street where it mattered which side you chose to make your home. Just living in Abu Tor, choosing a “mixed” neighborhood, was seen by some Israelis as a subtle sign that you harbored anti-Israeli views. The invisible border in Abu Tor was easy to see. It was obvious where West Jerusalem came to an end and East Jerusalem began. West Jerusalem ended at the edge of the garden below my living room window, and East Jerusalem started in the forest of satellite dishes rising from the crowded compounds on the other side of Assael Street. It looked as if development had swept over the top of the neighborhood, crept down to the western edge of Assael Street, and stopped. The higher side of the street was dominated by modern, multistory decorative stone apartment buildings covered with fragrant tangles of jasmine and thick canopies of purple bougainvillea. The balconies were covered with pots of flowering cacti and spiky aloe plants, snapping clothes lines and stacks of three-legged plastic chairs, Buddhist wind chimes and rainbow flag banners flying alongside Israel's blue Star of David. The big buildings sprawled out alongside a smaller number of refurbished stone homes, places once owned by Palestinian families, with elegant arched doorways, high ceilings and mosaic-tiled floors that were often rented outâat lucrative pricesâto Westerners like me. In four decades, the crown of Abu Tor had been transformed from one of the worst places to live in Jerusalem to one of the city's most desirable neighborhoods.